Experience the unique seed mixtures with indigenous wild herbs and edible wild flowers! 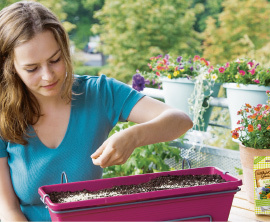 Harvest fresh, aromatic herbs straight from your balcony. Look forward to many tasty creations! Experience the huge variety with your own wild herbs! Whether it's a wild herb dip, a fresh and healthy summer salad or a delicious wild smoothie, get inspired by delightful Wild Gardener recipes! Have fun trying them out! Each “Wild Gardener” pack includes two sachets of seeds and a sowing aid, enough to sow at least two large sized (80-100 cm) window boxes. Of course, you can sow your Wild Gardener Seeds also in pots, tubs or even in your garden. Lay a thin layer of leca or gravel in the container (planter, window box, pot or bucket) – it will serve for drainage. This is followed by potting soil (which should ideally be peat-free) to just under the rim of the container. It is best to compact the soil with a small wooden board. Mix the sachet contents well prior to seeding to ensure a good mix of the seeds and vermiculite. Distribute seeds evenly but not too densely over the entire soil surface. Press lightly and then cover seeds with a thin layer of soil. Water well and keep moist for 4 – 6 weeks for good germination. Provide your seeds with some extra help with a weekly dose of Neudorff Multipurpose Plant Feed. Wild Gardener – fresh and wild straight from the pot! 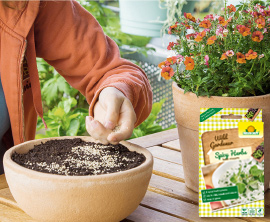 The unique “Wild Gardener” range features three extraordinary mixtures of seeds of herbs, aromatic plants and edible flowers which are ideal for sowing into pots or window boxes, but also in the garden. Grow your own wild herbs on your balcony or patio, harvest them and prepare delicious wild herb recipes! 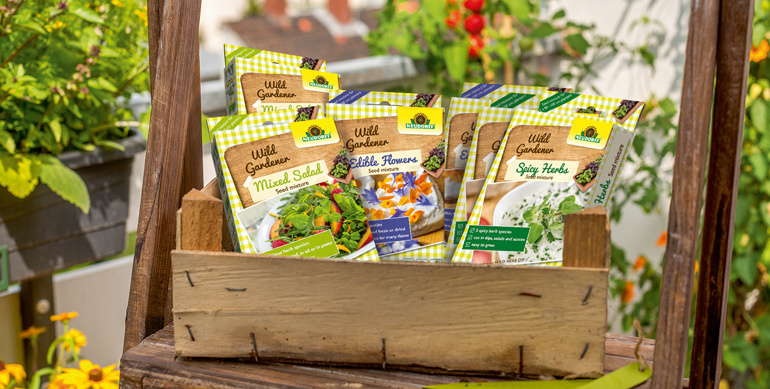 Whether edible wild herbs or flowers, with Neudorffs Wild Gardener seeds you will enjoy a natural delight!